Simply speaking, localizing an application means translating all output it produces on the screen (and printouts etc.) to the language of the people using it. There is more to it, though, than a simple translation of messages. You should also take care of using correctly formatted distances, weights etc. and any other kind of numbers in general. If you go a step further, you also make sure that e. g. plural forms are created with respect to the locale settings of your application’s users as well as using their calendar system — not everyone in the world uses the Gregorian calendar. As this is an involved topic, there are quite a few pitfalls one should know about — including how to avoid them. 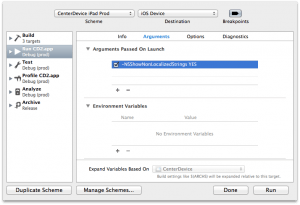 This article tries to provide some background and possible remedies for iOS and OS X applications. Apple’s two (major) operating systems OS X and iOS both provide the Cocoa (Touch for iOS) application programming interfaces. They both come with a powerful set of methods to allow you to create applications that delight their users with correctly localized output. The basic concept they use is to extract any messages that will be presented via the application’s user interface out of the source code or interface builder files (Storyboards and XIBs) into dedicated text files with the .strings extension. At runtime, your code can then look up the concrete values based on the language the OS (or just the application) is configured to use. For development, there are also ways to control this independently. Read on for more details. The key is some string you refer to in your source code to tell the system which localized string you want to use. 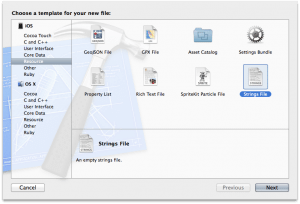 The keys are the same for all localized copies of a .strings file. The value on the other hand is the localized text for e. g. a button label, a table column header or an alert message. Looking up the localized version of say a warning dialog message is done by means of the NSLocalizedString set of macros. They are available on both iOS and OS X and come in a few variants. This macro will expand to the actual code that loads the correct Localizable.strings file for the current locale at runtime and that retrieves the entry for the key “Do you really want to log out?” from that file. So after executing this line, the localizedMessage string variable will contain the English version of that message if your app runs with an English language setting, but will have something like “Möchten Sie sich wirklich abmelden?” if you prefer a German user interface. You can use that string like any other string in your application now. In the snippet above you have seen the second string parameter with a short explanation of what the resolved string is going to be used for. The reason for including this – even though it does not show up anywhere in the finished application – is to give your translators some context on what exactly they are translating. While developers are usually good at writing code, they might not be the ideal authors of all the user interface labels and texts. Instead, this might be the job of a different department or at least some colleague who is more proficient doing so. Moreover, for any kind of foreign language, you ideally have some native speaker that can do correct idiomatic translations so that your app nicely fits the rest of the system. Often the context of a sentence or word can have dramatic impact on its translation into different languages. Just consider the word Windows: If it relates to a window being shown on the screen, it is fine to translate it to its German equivalent Fenster. However, when referring to the Microsoft Operating system of the same name, the word Windows would remain untranslated in most, if not all, non-English languages. Without providing some comment, a translator seeing just at the word itself would have no clue which case he was looking at. This has been the source of plenty of strange or outright wrong translations in a multitude of even high-profile applications. However, translators will, of course, not walk through your source code and try to find all the instances where you called out to NSLocalizedString and check both the key and the corresponding comments. Fortunately, there are tools that can perform this task automatically and create the content of the .strings files automatically. While Apple provides the very basic — and not very pleasant to use — genstrings utility, I much prefer the (commercial) tool Linguan. It makes scanning your source files easy and it also supports translations with wizard like interface. Check out their homepage to see a video of how it is used. As you can see, the comment is extracted from the source code and provided for your translators’ convenience. With the help of this little piece of text the software engineer provides, there is a much better chance of good translations, increasing the quality of the user experience. Because translating and development can progress at different paces, you cannot always prevent mismatches. 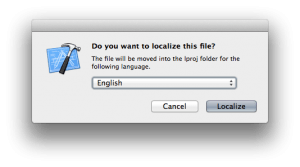 A typical situation that arises is that developers add new features — and with that new localizable strings — but the files from the translator do not yet contain these new keys. The default behavior of NSLocalizedString is to return the key in case no value can be looked up. This is good on the one hand, because at least for your base localization your users see a somewhat sensible text on the UI, but bad on the other hand, because for any other localization people will suddenly find a — for example — English message in an otherwise German speaking app. There are different ways of dealing with this. First of all, if you use Linguan, you can use its handy validation feature that will automatically point out missing translations. Before doing any release builds, you should just re-scan your code with it and see that it does not find any new NSLocalizedString invocations and also that for all configured languages all keys have appropriate values. This will cause the resource loading code that hides behind the NSLocalizedString macros to turn any string it cannot find a localized variant for into ALL UPPERCASE, basically shouting at you to provide a translation. The primary disadvantage of this is that you need to check each and every piece of your interface for these exclamations, including all kinds of error messages etc. Tedious, but not impossible. Generally iOS and OS X applications inherit the language and regional settings from the operation system. So if you have configured your iPhone or Mac to use English as your primary language, any application that gets run will also go for English output. For testing, however, this can prove to be rather annoying. Switching the language requires digging into the appropriate system preferences panel and waiting for the change to be applied. On OS X this generally requires logging out and back in again, while on iOS it will at least restart a good portion of the phone software. But there is a way around that. By running any application with the AppleLanguages command line parameter, you can explicitly request it to be run in a different language from the system default. To run an application with German localization on an otherwise English system, add AppleLanguages (de) to your argument list, just as you did with NSShowNonLocalizedStrings. For existing OS X apps you can use one of several tools that even allow pinning applications to a different language permanently. One example of such an app is the free App Language Chooser from the Mac App Store. Up to now we have only ever talked about resolving keys to the “correct” language specific strings, the term Pseudolocalization describes a testing approach which resolves the keys to some kind of special string which allows for better testing of your software. Most often the term is used for the process of using the original language texts which are then modified e. g. by swapping out characters for ones with diacritic marks etc. Even the simple UPPERCASE transformation that can be achieved with NSShowNonLocalizedStrings described above already qualifies as pseudolocalization. However by investing just a little bit of extra work, we can gain some nice additional features. But first of all, let’s see how we can influence the text resolving globally. While NSLocalizedString is the default way to localize application strings, you do not have to use it. As mentioned above, it is just a macro. 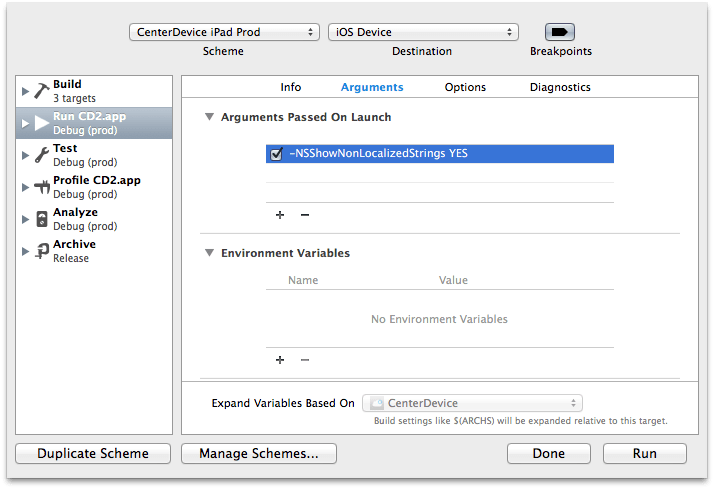 In our apps, for example, we use a custom version called CDLocalizedString — which is implemented not as macros, but as regular C-functions. They are declared in a file called CDLocalizationFunctions.h with an accompanying implementation (.m) file. Both Linguan and genstrings can be told to use these instead of the default NSLocalizedString. To make them available in all source files of a project, just include the .h file in the precompiled headers (.pch) file for your project or target. While the primary reason we use these custom functions is to get more fine-grained control over the actual process of the message lookup (more on that in a later blog post), it conveniently also allows a different way of highlighting missing localizations. None of these strings would stand out during testing (apart from their particularly bad choice of words in this simple example). Only running with a different language settings would make this English message stick out like a sore thumb. According to Murphy’s law, of course, this would only be noticed until after the app had been released. Any message in our user interface that does not have these paragraph symbols around it is immediately recognizable as a potentially missing use of CDLocalizedString. I hold a rather strong belief that most kinds of lookup keys (be it database keys or those in .strings files) should be some kind of artificial value, and not something that is driven by functional requirements. Whenever I saw systems where usernames, email addresses, or any other kind of “meaningful” values were used as lookup keys, sooner or later they got into trouble when those values needed to be changed. This allows for easier grouping of messages in the resource files and also encourages each and every text to be reviewed by someone else than the engineer. Sticking to a well-defined pattern also makes finding existing messages easier. In some cases this structure might even help translators with one additional bit of context should the comment not be perfectly clear. As you can see, there is quite a few things to consider when trying to get your applications user interface set up for more than one language. We covered the basics of adding localizable .strings files to an Xcode project, configuring additional supported languages, the use of NSLocalizedString in code and the automatic scanning of your source to create the .strings content automatically. Moreover we looked into some ways to debug localization issues with missing translations and/or keys and added a basic custom set of pseudolocalization functions. What is missing is the use of separate localization tables, resolving from other bundles than the main bundle, using parameters, formatting data and more. At least a few of these topics will be part of a future post. I’d love to create separate .strings files for all my classes (for better encapsulation), but I’m struggling to get my custom macros (pointing to my custom tables) to work with Linguan. A quick and cheap (free) way to pseudolocalize strings can be found at Pseudolocalize.com. I built that site after not finding anything similar available on the Internet!